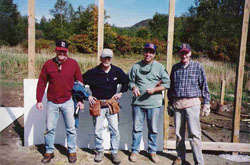 On a cold, rainy weekend in September 2000 Pat O’Connor and a handful of his friends gathered in his backyard to dig a set of four foot holes in the ground – thirty nine of them. Pat took out his Little Fenway blueprint (a coffee stained napkin he & Bill Livingstone had scribbled on) and pointed on the ground where ea ch of the holes needed to be. Just one week earlier Pat had contracted with a local business to bulldoze and level an overgrown field in his backyard with an area of approximately 10,000 square feet. But on this day Pat’s team ran into a major construction obstacle on holes one through five. They hit ledge about two feet below the surface. It was the perfect opportunity to call it quits, chalk it up as one stupid idea, cut their losses. After a few guys cracked some jokes about how this project ranked up there as one of the most bizarre, crazy endeavors they had ever witnessed (they were too kind to walk out), the team decided to skip the first few holes and dig the rest. Fortunately they only met resistance from some large rocks…no more ledge. The following weekend Pat rented a powerful jackhammer and blasted away enough of the ledge to achieve the necessary depth for the first five holes. These holes were the Construction Picturefirst step toward building the Green Monster, and the centerfield wall, and the shorter right field wall. Thanks to an engineering team at IBM Pat knew how deep the sixteen foot pressure treated wooden poles needed to be and how much support was required on the back of the Green Monster to protect it against the heavy winds and inclement weather. With the aid of a hundred bags of concrete the wooden walls went up followed by the foul poles. Paint specialist Brian Stevens cleverly scraped some paint off the Red Sox dugout at Fenway Park so the construction crew could match the color at a local paint store and use true Fenway Green. By the time Bernie Carbo, Red Sox home run hero in the 1975 World Series, showed up to play a game with some of the neighborhood kids in October 2000 you could detect a glimmer of what Little Fenway was to become. After a typical long, cold Vermont winter with plenty of snowfall it was time for phase two of the construction effort. April through June in 2001 included cutting the infield, laying sod, installing a scoreboard that looks identical to the Fenway Park scoreboard of Board2001, and adding the coke bottle and citgo signs. It took seveal trips to New England rock quarries to identify dirt with the same color and granularity as several samples of dirt scooped up from the infield and track at Fenway Park by a friendly groundskeeper. By Opening Day, July 4th, 2001, Little Fenway looked spectacular. It was ready for…. you guessed it… a Yankees vs. Red Sox game.